Dr. Oz the Terrier here with an important Pet Dental Health Month reminder that it is never too late to start paying attention to your dog's dental health. We dogs like to show off our pearly whites but to be able to do that, we need to keep our teeth clean with some kind of dental health routine. If you are a dog who will not accept your teeth being brushed, you can still keep your teeth and gums healthy by using dental treats. Why a Dental Health Routine? Just like humans, without proper care a dog's teeth can accumulate plaque and tartar which, if left untreated, can lead to gingivitis (inflamed gums) and periodontal disease. The bacteria associated with the progression to periodontal disease can undermine the supporting structures of the teeth, leading to tooth loss, and can also travel through the bloodstream to infect the heart, kidneys and liver. Over 80 percent of dogs and 70 percent of cats show signs of dental disease by three years of age. And it all starts with those little bacteria that build up on a dog's teeth and create plaque. Dental plaque can be removed by brushing the teeth or chewing a dental treat. Once that plaque hardens into tartar and moves under the gumline, it can only be removed by a vet during a complete dental cleaning. 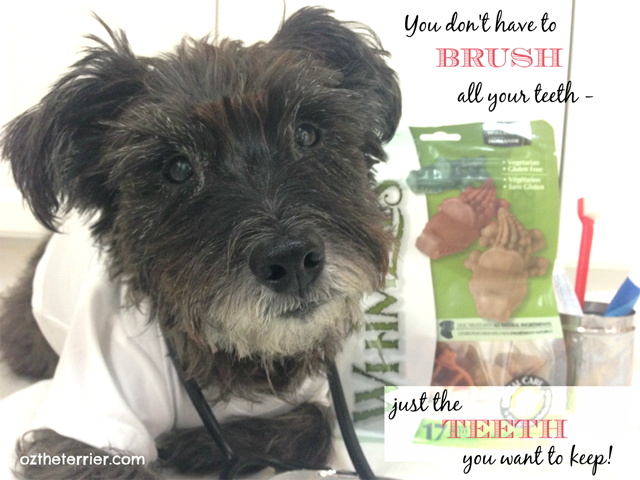 This is why it is so important to have an at-home Dental Health Routine for your dog. Even if a dog is not fond of having their teeth brushed - and I know many pet parents find it difficult to do - you can still maintain your dog's dental health by offering them a dental treat. Dental Treats are formulated to remove the plaque build-up on a dog's teeth just as brushing would do. 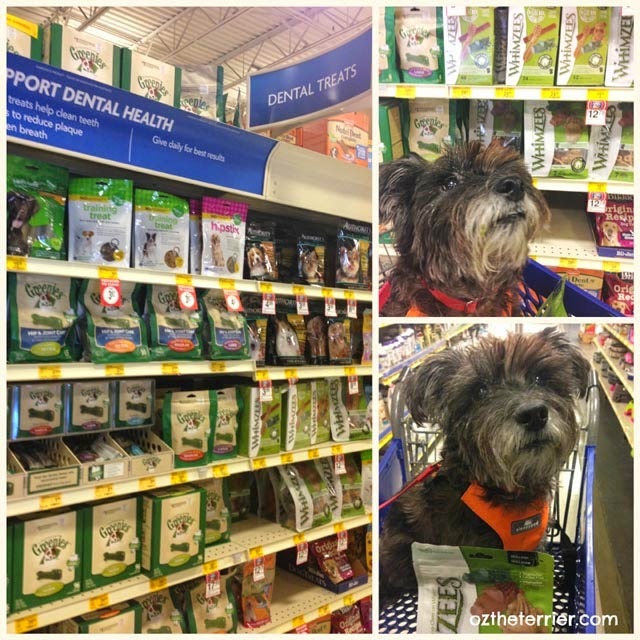 You can find many brands of dental treats at your local PetSmart® including Authority®, Dentastix®, BLUE Bones®, GREENIES® and my favorite, WHIMZEES™. All you need to do is find your Dental Treats aisle. I give my PetSmart store (#336) a big shout-out because their dental treats are right by the checkout! You can't miss them! WHIMZEES are my favorite dental treat and they are super fun. They are not your typical dog chew as they come in a variety of shapes like toothbrushes, hedgehogs and, this is one reason they are my favorite, alligators! Each shape comes in a variety of sizes to suit all size and breed of dog. At WHIMZEES, everything they do is for you and your dog. They are a company of dog-lovers, people-lovers and Earth-lovers who are obsessed with bringing only the best, healthiest and most fun products to the world. And they do it in a sustainable, socially-responsible way. WHIMZEES have six natural, functional ingredients and no artificial ingredients, colors, flavors, preservatives, GMOs, gluten or meat. They are high in fiber and low in calories and sugars. And they are fun to chew! If you take only one thing away from this, let it be: Dr. Oz the Terrier encourages you to have a regular Dental Health Routine for your dog to help address dental problems when they are minor, preventing the damaging effects of periodontal disease on your dog's teeth and its overall health. Do you have a Dental Health routine? Do you have a favorite Dental Treat? I heard that these loads of calories in teef treats like dentastix so I'm not allowed them. I has to chew on a toof brush instead! Hmmm, Princess Leah...I'm not sure what the calorie count is on the WHIMZEES. I cannot find that information as part of the guaranteed analysis. It does say "Crude Fat (min) 2.3%". I don't know if that helps you or not. Thank you, my Bichon pals! I wish you would get WHIMZEES as often as you would like! Yes, there are times my Ma pulls out the toothbrush as well Easy...but I also get to chew on raw meaty bones which helps to keep your teeth clean as well. We use good bones for gnawing on to keep our teeth clean and have found that works perfectly for us. Yes, I get raw meaty bones too and they do help a lot! One time, the vet found some tartar build up on one of my teeth...so Ma gave me an extra bone or two. Next time at the vet, the bones had actually helped chip away the tartar. The vet was impressed! Wow wish we had those over here Oz. Have a tremendous Thursday. You just may, Molly. They are made in Holland so maybe they ship to UK too?!? I have found the WHIMZEES are a more difficult chew. Some of the other brands, I can chew up in no time but these last much longer for me. Not sure how they would work for a big dog who is an aggressive chewer though. We brush and we use chews as well. My huskies just love the Whimzees dental chews! We always have some on hand!! And I must say, you just look absolutely adorable in the shopping cart!! Ha Ha, thank you Jenna. I am glad to hear the Huskies love the same chews as me! They have some pearly whites! Once a week mom brushes our teeth cause we swallow our greenies almost whole. Yes, I am the same way with some of the other dental chews. However, we find the WHIMZEES are a longer lasting, more difficult to chew chew. Oh yes, Sugar...chewing the WHIMZEES is a lot of FUN. MOL MOL Dr. Dentist Oz the Great!! We love that saying...Mom's dentist has it framed in his waiting room. A very impawtent post. Well done! "....just the teeth you want to keep." LOVE it! Oz you are so smart! Those alligator treats are so cute! Great advice, Dr. Oz the Terrier. Our sister Zoe now gets her teeth brushed lots! This is such an awesome "pin" ☺ Bentley loves brushing his teeth! I am heading to PetSmart this weekend to pick up some Blue Bones, but I will definitely be picking up a Whimzee alligator too! After the chat the other night, we know we need to try the Whimzees too. We want all of our teeth, so we work on them all, all the time. Love the Dr Oz pic. Oz you are an adorable little rascal! Thanks for telling us about your new dental chews. Our fav is Greenies, but these are on our list to try next! We've been hearing so many good things about them and our dental health is so important! Dr. Oz you are the best. I am bad and don't brush the gangs teeth much, I do give them lots of chewies and bones and they love greenies. I am going to have to find those Whimzees cause they are just too cute! My Person brushes my teeth every night, and I run into the bathroom and wait for Her to put the toothpaste on the brush. I also partake of bones and dental chews, although I have not yet tried the Whimzees (I usually get Zuke's). The dental chews are by the checkout at our Petsmart too. I really like WHIMZEES because they are are so natural and come in really fun shapes.